EPF or Miracle EPF is a true wonder product. It is something everyone should have on hand. It is powerful enough to kill bacteria, fungus and parasites. It also can cleanse heavy metals and pesticides from your body. It is truly an amazing product and one that I want everyone to know exists! Unfortunately the manufacture of this product is not able to be reached for me to order or stock up on this product. I am not sure what happened but it is a problem all distributors are having at the moment. If/when something changes I will update my site or contact you if you wish. Email me by using the contact me page and I will keep updated. Sorry for the inconvenience! 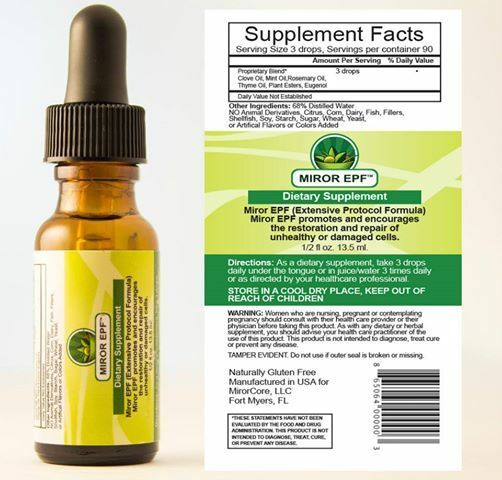 Miror EPF Products – SHIPS FREE! Miracle Product for MRSA &#8211; Miror EPF to the rescue!